They are claiming at least one was a Syrian refugee. What is the USA and Canada going to do now about their plan to take in Syrian refugees in the light of this attack? ARE YOU KIDDING … OBAMA FURTHER MAKES THE UNITED STATES A SECOND CLASS WORLD POWER. According to news reports, Vladimir Putin and the Russians are launching airstrikes in Northern Syria against ISIS. As per accounts the Russians demanded that the US keep their war planes out. Seriously, is Obama going to show his true colors and cower to Putin? Could Barack Obama be any more of a failure? The dude is Jimmy Carter on steroids. 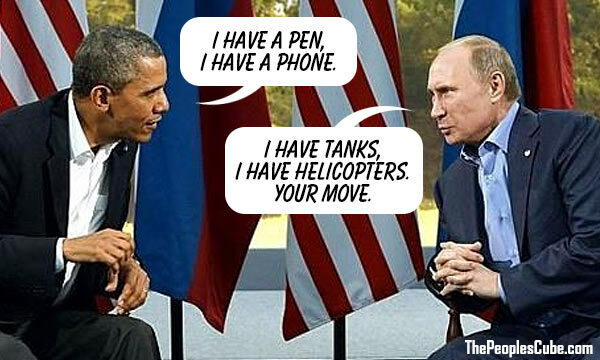 Also, how sad is it that Putin has a plan to defeat ISIS and Obama does not. This is what happens when you have an apologist as a leader and one that you even wonder if he even likes America. And we are not talking about Putin. The official said airstrikes targeted fighters in the vicinity of Homs, located roughly 60 miles east of a Russian naval facility in Tartus, and were carried out by a “couple” of Russian bombers. It was not clear if the strikes targeted ISIS, Al Qaeda or other forces opposed to Assad, who Moscow is aiding. According to a Twitter handle belonging to the Syrian government, the Russian strikes were initiated at the request of Assad. The development came after Pentagon officials brushed aside an official request from Russia to clear air space over northern Syria, where Moscow intends to conduct airstrikes against ISIS on behalf of Syrian dictator Bashar al-Assad, according to sources who spoke to Fox News. ABC News: US Confirms Russian Airstrikes in Syria. A U.S. official confirmed that Russian military aircraft conducted airstrikes today in the vicinity of the city of Homs, Syria. The Russians gave the U.S. only an hour’s advance notification that the airstrikes were about to occur through a message conveyed to the U.S. embassy in Baghdad, Iraq, a U.S. official said. UPDATE I: Russia ‘launches air strikes again’, targeting rebel alliance in Syria. Russian jets bomb rebel positions in Syria including rural areas near the north-western town of Jisr al-Shughour, a day after launching air strikes. News agencies reported that the ministry confirmed that Sukhoi-24M and Sukhoi-25 aircraft flew eight sorties. They hit an ammunition depot near Idlib as well as a three-storey Isil command centre near Hama. It said a pinpoint strike had destroyed a facility located in the north of Homs aimed at rigging cars with explosives for suicide attacks, Reuters writes. UPDATE II: Russia vehemently defends Syrian airstrikes and denies targeting U.S. -backed rebels. Russian officials vehemently defended the country’s airstrike campaign in Syria Thursday, denying reports of civilian deaths and Western accusations that the country was targeting U.S.-backed rebels instead of the Islamic State. Vasily Likhachov, from Russia’s lower house of parliament, described the claims as“the latest anti-Russian attack” after “the pendulum of public international opinion had swung back in the direction of Russia,” the Interfax news service reported. The Russian ambassador to France, Alexander Orlov, said Moscow’s intervention came after a year of airstrikes by the U.S. and its partners had failed to dislodge Islamic State extremists in Syria, the Associated Press reported from Paris. Orlov said the accusations formed part of a “war of disinformation,” saying Russian officials had warned the U.S. “via confidential channels” of where they planned to strike, the AP reported. 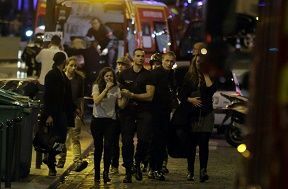 U.S. officials say they were only given notice Wednesday.